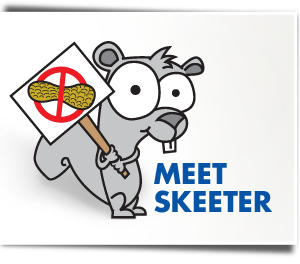 Smart Allergy Friendly Education: Skeeter Snacks - NO NUTS. NOT EVER - Music to My Ears! Skeeter Snacks - NO NUTS. NOT EVER - Music to My Ears! As an advocate and educator in the food allergy world, I am well aware of the focus given to the many seemingly, avoidable food allergy fatalities which wrapped up 2013. As a mother of two, each managing multiple food allergies, including anaphylaxis to peanuts, I am even more motivated to help provide greater education and product ideas for those navigating this challenging journey. Skeeter the Squirrel is allergic to nuts! Everything is his product line is SAFE for him and your nut allergic kids to eat!! Skeeter Snacks, distributed by Skeeter Snacks, LLC, Rogers, AR, 72758. Want to learn more about Skeeter? Be sure to visit SKEETER SNACK FOR KIDS link to learn more about Skeeter and Skeeter Games! As a fan already of Skeeter the squirrel and the line of nut-free cookies he represents, I was pleased to be contacted to try out their latest treats. Once again, I was not disappointed. These all-natural, whole grain snacks have a crispy crunch, great taste and can be found in many local stores. Enjoy them at home, stock them at school and share with friends! Ingredients of Skeeter Cinnamon Grahams include: WHOLE WHEAT FLOUR, WHEAT FLOUR, SUGAR, CANOLA OIL, CINNAMON, MOLASSES, NATURAL FLAVOR, LECITHIN, SODIUM BICARBONATE (A LEAVENING AGENT), SALT. CONTAINS: WHEAT, SOY. Ingredients of Skeeter Chocolate Chip Minis include: WHOLE WHEAT FLOUR, CHOCOLATE CHIPS (SUGAR, CHOCOLATE LIQUOR, COCOA BUTTER, ANHYDROUS DEXTROSE, SOY LECITHIN, VANILLA EXTRACT), BUTTER, BROWN SUGAR, SUGAR, EGGS, NON FAT DRY MILK, BAKING SODA, SALT, VANILLA. CONTAINS: WHEAT, MILK, EGG, SOY. NO NUTS. NOT EVER. Music to my ears!